The Prince of Wales visited Lancashire today for a series of engagements that included meeting residents in the town of Clitheroe, hearing about apprentice schemes, and visiting a family-run cheesemakers. To begin the day, His Royal Highness visited Clitheroe and was given a preview of the wares on offer at this Summer's Clitheroe Food Festival. During a walkabout, The Prince met local food producers and traders who showcased their goods in a promotional event for the festival, as well as local residents who had gathered to welcome him to the town. One of the businesses His Royal Highness visited during the walkabout was Cowman's Famous Sausage Shop, butchers for more than 100 years, which stocks more than 70 varieties of sausage. The Prince asked butcher Paul Howard how he kept inventing new sausages and he replied: "Inspiration, ideas that come from customers. Whatever they say or need and we just create them." 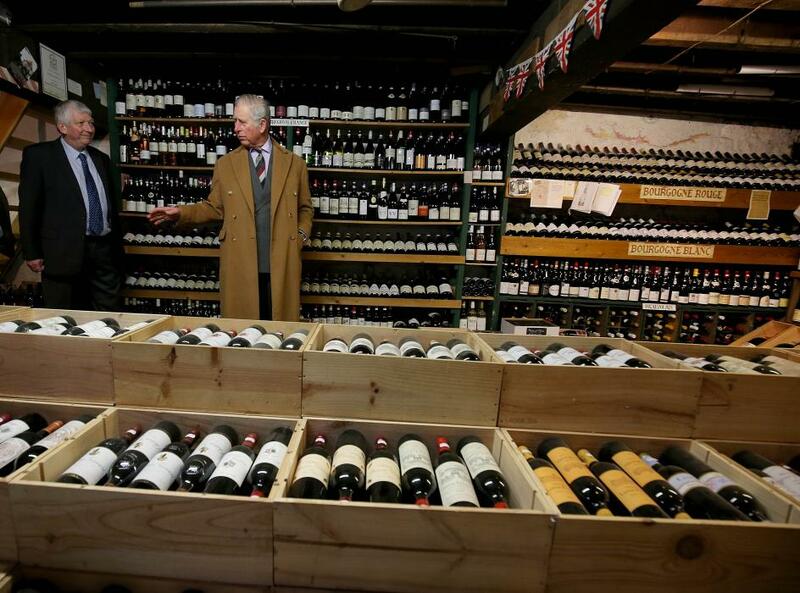 His Royal Highness also visited multi-award-winning independent wine merchant D Byrne and Co, run by the founder's great-grandsons Andrew, Philip, Tim and Joe Byrne. The shop stretches into labyrinthine cellars that run under the King Street store and is relatively unchanged from when it was built in the Victorian era. The Prince of Wales’s next stop in Lancashire was the Academy for Skills and Knowledge at BAE Systems in Samlesbury, where he met staff, students and schoolchildren. The academy, situated alongside BAE Systems' advanced manufacturing centre, will train all the apprentices and graduates in the company's military aircraft business as well as providing life-long learning and skills development activities. It mirrors the latest advanced manufacturing technologies and factory layouts used at BAE Systems including robotics, 3D printers, a virtual reality "cave", a composites clean room, electronics and welding facilities. The final engagement of the day was to family-run Dewlay Cheesemakers of Garstang. As Patron of the Specialist Cheesemakers Association, The Prince was given a tour of the dairy and also met the firm's nine local suppliers, as well as agricultural students from nearby Myerscough College. The Prince of Wales has been carrying out engagements in #Lancashire today, and this afternoon HRH visited Dewlay Cheesemakers of Garstang, a family-run firm that is marking its 60th anniversary this year. The Prince was able to see this fantastic display of cheese during the visit! HRH also met staff and local farmers who supply the firm. Third generation cheesemaker brothers Nick and Richard Kenyon have continued the handmade techniques which their late grandfather and father used before them. The visit was commemorated by His Royal Highness unveiling a plaque outside the premises of the firm, which is in its 60th year of business.